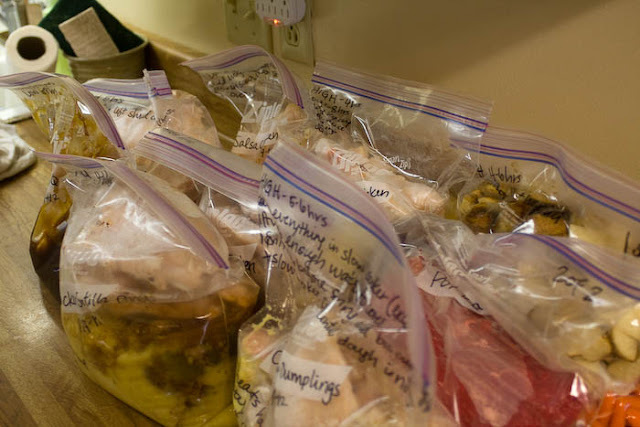 Pure Joy Creative: freezer crock-pot meals! I've been REALLY bad about meal planning lately. Like, throwing something together at 5pm. And I'm not even working away from home...I have no excuse! ha! Anyway, I thought about putting together some freezer meals for after baby girl is born...and really for before too (you moms out there know how unmotivated you can be to do ANYTHING in the last weeks). So I did some research and started a Word Document with TONS of freezer crock-pot meals to make. But I decided to make it really easy on myself and just did what another great blogger did before she had a baby. I used the recipes that she posted and I pretty much followed her directions to a "T" minus the Reynolds Slow-cooker bags. The recipes that I got and followed were all from Freebies 2 Deals. I just copied the recipes into a word document, printed the two pages and wrote out my grocery list. I opted to buy the flash frozen chicken that comes in the big bags at Kroger but you can use fresh chicken if you want then it'll just be frozen once you're done assembling your bags and put them in the freezer. 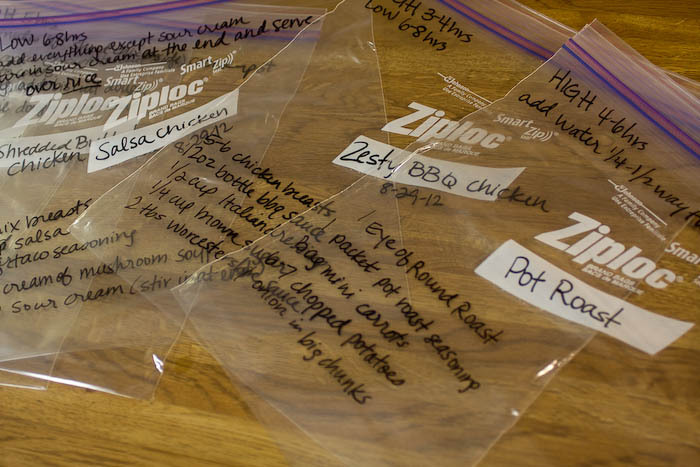 So here's a run-down of how I assembled my freezer bags. You may find an easier way to do these but this is what I tried and it seemed to work pretty well. I was done with assembling the bags in an hour and ten minutes. First I wrote the name of the recipe and the date, then on the bottom left side I wrote the ingredients. On the top left of the bag I wrote how long it needs to cook and if anything else needs to be added later. 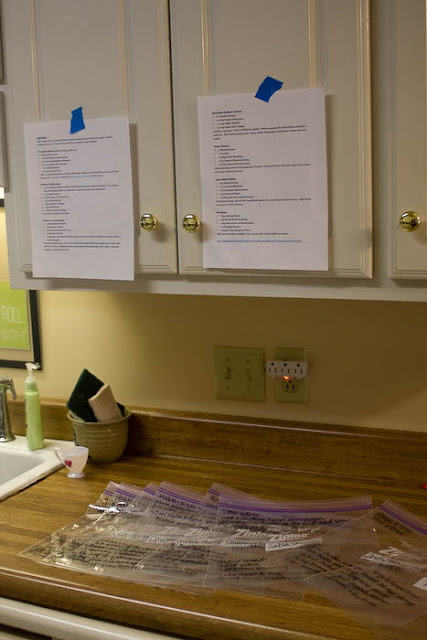 I taped the printed out recipes onto my cabinet doors for easy reference. 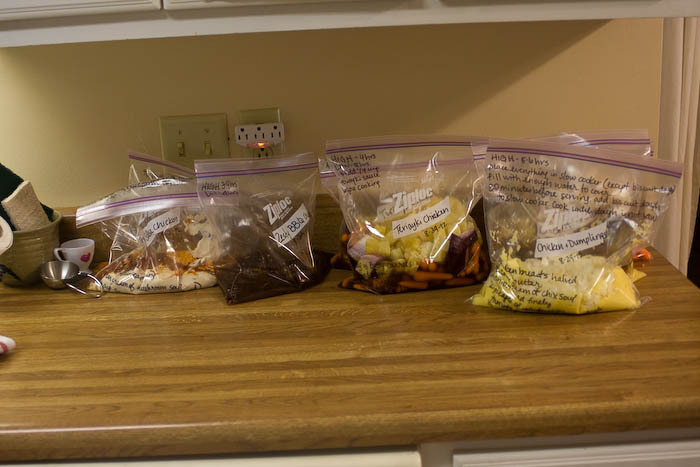 Then I laid out all the ingredients that went into each bag MINUS the frozen chicken. I just assembled one bag at a time and this seemed to work pretty well. 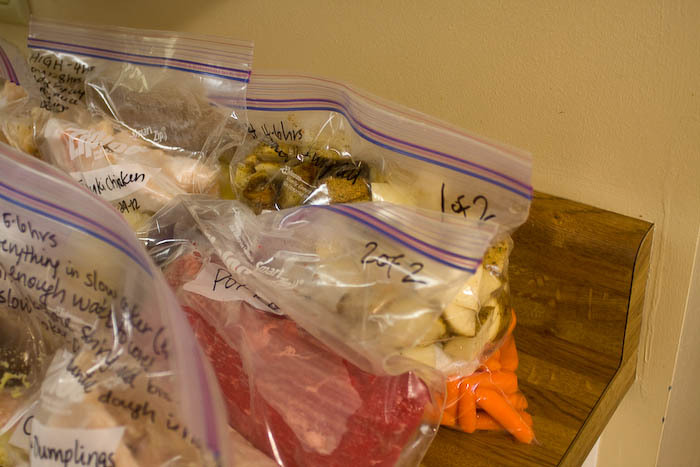 I waited until ALL the bags were assembled before I added the frozen chicken, thus keeping it frozen and not having to worry about cross-contamination. Here are the bags minus the chicken. I did need a second bag for the pot roast because the roast itself was pretty big so I just labeled the top right corner 1of 2 and 2 of 2. 8 freezer crock-pot meals in 70 minutes!! yay!! Most of these are just the main dish and may need a little prep of a side dish on the day of but I'm so excited to have these in my freezer and to not always have to think at 5pm...what's for dinner?! And a few quick tips...get out your cutting board and big knife ahead of time and get a little bowl to throw your garbage in when you're chopping..saves a lot of time. Also, make sure to have your garbage can handy for all those cans and other little things you'll need to throw away. Ours is usually under the kitchen sink but I pulled it out during my assembly session to make it easier on myself. I also used my apron with a towel to have something to dry just my hands on after I washed them...over and over and over again! Keep another towel handy for drying counters and cleaning up messes! Mama and Baby Love is another great website with lots of great recipes and ideas about freezer crock-pot meals. She has an ecookbook that I'll probably buy after I try out some of the other free recipes first. I found another GREAT meal website. It has meal plans for a week at a time that include the recipes, and a shopping list...making my life a LOT easier! It is Eat At Home Cooks and there are THREE years worth of weekly meal plans...for FREE!! 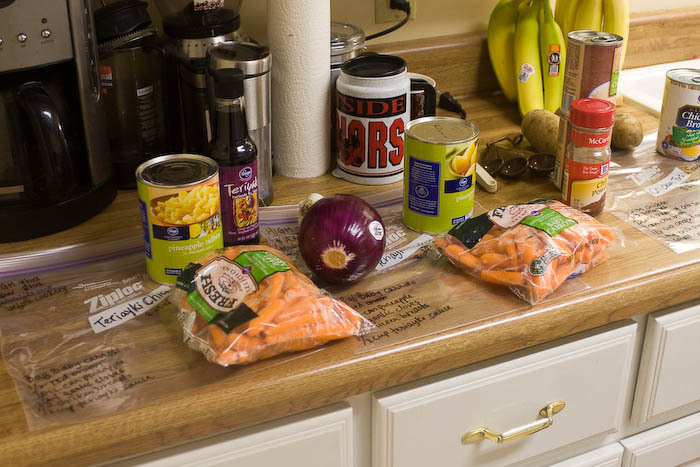 There are low cost meal plans, stock your freezer meal plans and other options as well. Each meal plan includes 6 meals and 1 dessert. So far, we've tried the tilapia with veggies baked in a foil packet. I haven't willingly eaten fish pretty much ever...but I figured it was time to try something new and my family likes fish so I made it. I have to admit it was pretty good! I'm looking forward to the other things on the menu as well, and having a meal plan at the beginning of the week is SO nice! Takes the pressure off. And these meals are ones that we'll actually EAT!! So my freezer is stocked and my meals are planned for the week. If only I can keep this up! Here's hoping! Thank you!! I have officially added this to my 'things to do b4baby' list that will be my focus for Sept. My sister-in-law is currently being flooded with meals from friends and family since having baby #4. I don't see the same blessing in our future so this will help sooo much! I did something like this before my son was born and I think it saved our lives afterward. I was not up for cooking dinners. We might have starved. Thanks for sharing the specifics of your process. I hope you enjoy the meals you made. Good luck with the upcoming labor and delivery. What an exciting time for you and your family!